New York City - Gift-Tours Travel Guide to NYC Tours, NYC Attractions, and More! Come and visit the great “City that Never Sleeps,” or as many might know as the Big Apple. Be prepared for the time of your life in the fast lane of New York City. With a diverse population of people, entertainment, and culture, New York offers non-stop fun for everyone! Sightseeing in New York During your holiday in New York, see the bright lights that light up the New York City and its incredible skyline. 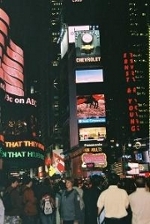 And while you are in the great city, do not miss out on the incredible Times Square. Known for its gigantic television screens and billboards on the buildings, it is a wonder that attracts many tourists. While you’re at it experience the many other attractions that New York has to offer! New York City welcomes every traveller with welcome arms and you can visit the exact location. The Statue of Liberty and Ellis Island offers the amazing history of American immigration. The city of New York has many other attractions to offer such as the Empire State Building, the infamous World Trade Centers, Madison Square Garden, Central Park, Rockefeller Center, Wall Street and many more! Other than its famous sightseeing attractions, New York is also a hub for art and culture! New York City has much to offer in the interest of Fashion, Theatre, Art and Music. From high fashion on 5th Avenue to bargain buys in Soho, New York is the place to be for the fashionistas of all budgets! Moving along to Broadway, world renowned for theatrical talent in Dance, Musicals, Operas, and Dramatic plays. Although many of the greatest talents are on Broadway, New York's art and music talent has no limit to location. Whether in the streets, subways, buildings, galleries, art and music can be found around every corner in New York City! New York City welcomes travellers of all ages, budgets, and interests. Whether you are looking to visit and stay in an accommodation in the upscale Manhattan areas of Upper West Side, Central Park, Times Square or more low budget trendy areas of Harlem, Greenwich Village and Brooklyn... New York City is suitable for everyone! And no worries about transportation in NYC, the busses and subway system run all day and night no matter where you stay in town! With so much to do and see, why not save some time worrying about your next move and plan your travels ahead of time with Gift-Tours! Gift-Tours offers everything you will need for your travel in New York including accommodation, transportation, tours, and just quality information for our travelers. For more information about accommodation in New York City, please search for the perfect NYC accommodation through our search engines, submit an enquiry with, or contact us!